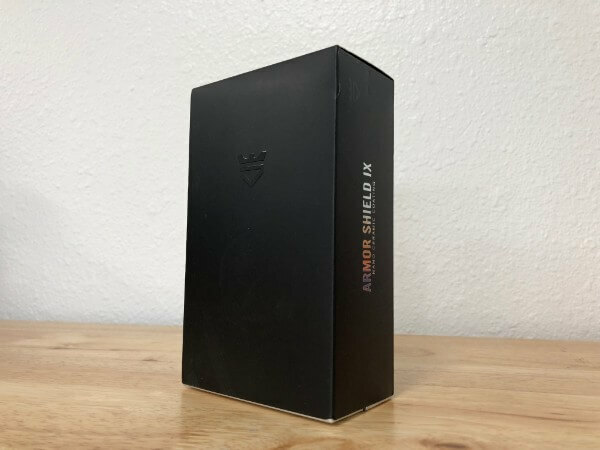 Recently AvalonKing reached out to me and wanted to know if I would be interested in trying out their Armor Shield IX ceramic coating. Having never heard of this product before I jumped to their website to check it out. I was a little impressed with the presentation of their product on their site and their marketing in general. These folk definitely have that recipe down. After checking out the site and skimming the reviews (most of which are glowing) I was more than a little excited (and somewhat skeptical) to check this product out. 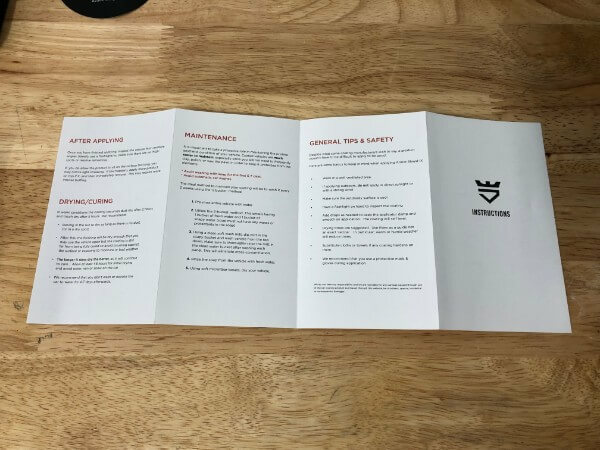 I reached back out to AvalonKing and they were generous enough to hook me up with their Armor Shield IX DIY Kit in exchange for my honest review. If you’re short for time, and just want to know if the kit is worth it so you can move on with your day, the answer is yes. If you want to know why, read on! 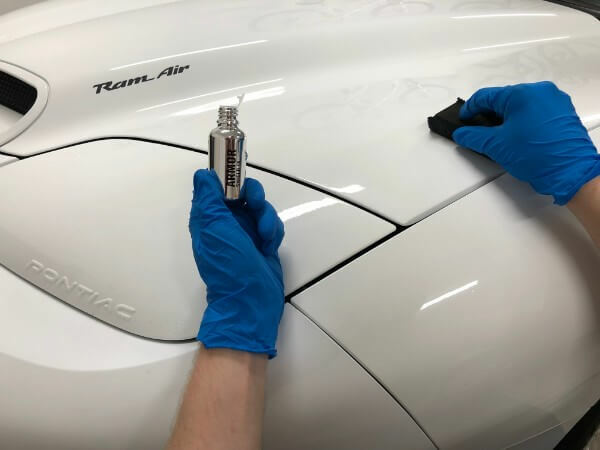 When you have an order from AvalonKing on it’s way you’ll start receiving emails from AvalonKing with tips on prepping your car for the coating. In my case this included an email each day with prep tips along with a final email with a full detailed video of what I was about to undertake when my coating arrived. Along with these tips and video instructions you get tracking updates with detailed location information as to where your package is at on it’s journey. AvalonKing’s presentation doesn’t just stop at their website. 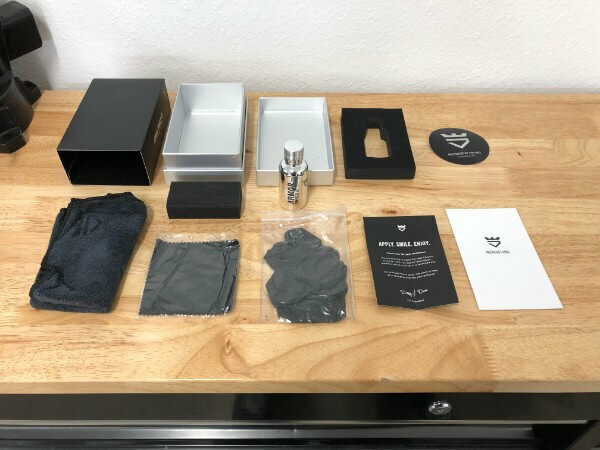 Their ceramic coating comes in a swanky box reminiscent of a high end men’s cologne or a fine watch. 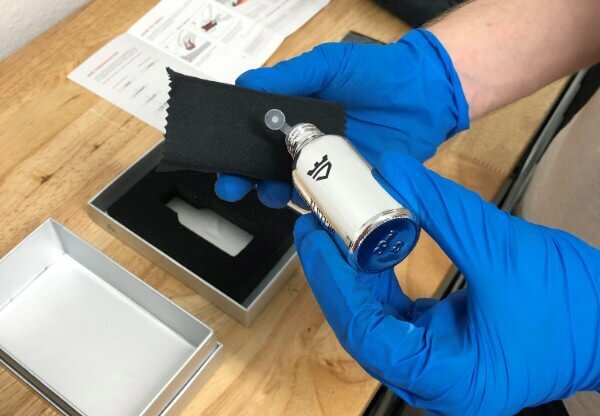 Sliding the cover off the box reveals a two piece silver box with a velvety insert holding tightly to the shiny bottle of ceramic paint coating. AvalonKing does a great job here of making you feel like you received something worth the price you paid even before you actually used it. Though I have to wonder how much savings could have passed on to the consumer with a bit more modest packaging. But without the presentation they would likely fade away into the sea of the countless other coatings out there. So I get it. It’s hard to see in the picture above but right above the bottle is the foam applicator pressed into the box. 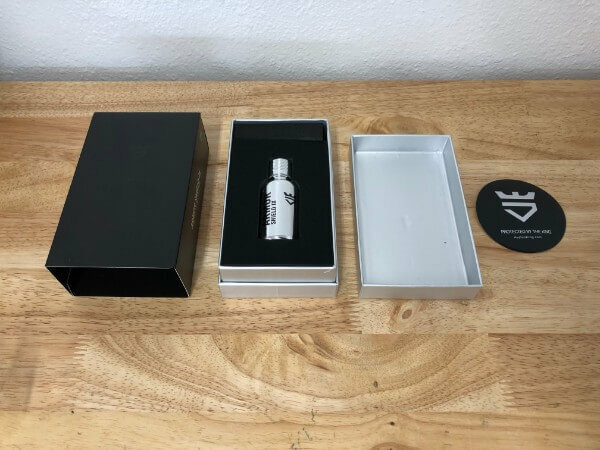 Removing the applicator and the velvety insert holding the bottle reveals all the other goodies that make this a complete kit. See what I meant when I said impressive? Opening the package was like opening the gift that just kept on giving. The foam applicator and suede cloths are great quality and easily a $10 value by themselves. The black low pile microfiber cloth is just ok. When doing any kind of fine work on paint, be it polishing or wiping off excess product, I prefer to use a more plush and higher gsm towel. I admit I’m a bit spoiled when it comes to towels, though, given my collection of Towel Titan, The Rag Company, Adam’s Polishes, and Chemical Guy’s towels. That said, as you’ll see later in the review, the included towel is perfectly sufficient. 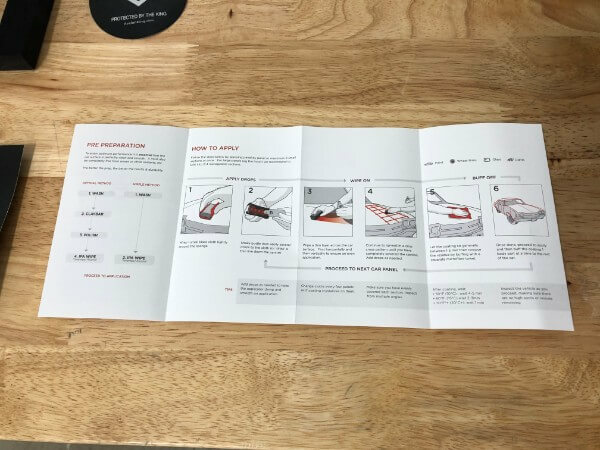 The instructions, pictured below, are pretty amazing. I say that because most other coatings come with a vague set of instructions printed on the bottle or a link to a video. It’s nice having proper, well illustrated instructions you can hold in hand and reference along the way. Plus, I don’t like fumbling with my phone or a laptop/tablet while in the middle of paintwork projects, especially when chemicals are involved. 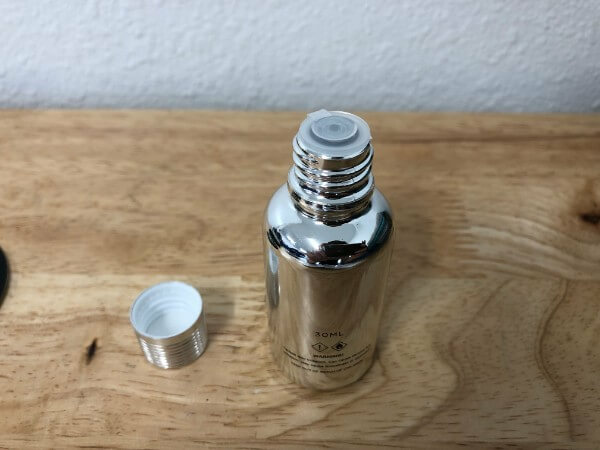 Looking at the bottle itself, I liked that it has a plug seal along with the cap to pretty much guarantee you wont have a leak in transit and you’ll be able to reseal the bottle should you have any product remaining. The bottle is also very sturdy, again insuring that you don’t unintentionally lose any of the coating you paid good money for. Alright, enough gloating about the excellent packaging. Let’s prep the paint and find out if the coating is actually any good. That’s really what you pay for. As with any coating, you want to make sure your paint is in the best condition possible before you apply your coating. 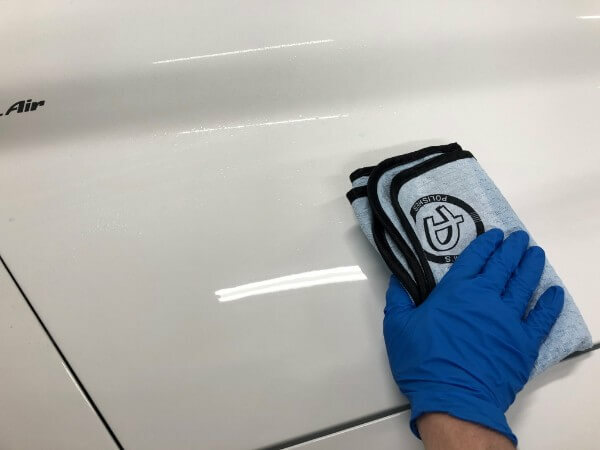 Any imperfections or contaminates will essentially be sealed in by the coating for the lifetime of the coating or until you polish the coating away. Fortunately for me, the vehicle that I had available was already fully paint corrected and coated in the past so I didn’t have to spend as much time on it as a person would that was starting with a virgin vehicle. Here are the steps I went through to prep my paint. Typically I would use the two method of washing before taking on a project like this but like I said this car has already been treated and barely see’s anything other than perfect weather. Since it was mostly just minor dusting on the paint I opted for a waterless wash. I prefer these over a normal bucket washing for this vehicle when I can because I don’t like inviting water places it doesn’t need to be to reduce the risk of rust. For my waterless wash I sprung for Adam’s Waterless Wash. The next prep step is to clay the paint. 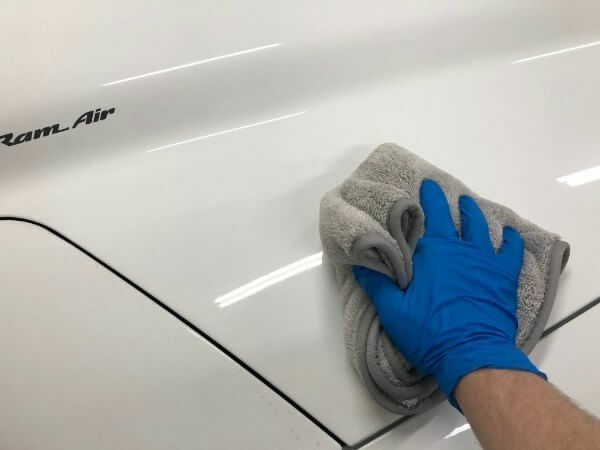 I opted to clay using Adam’s Polishes Detail Spray and Clay Mitt which really sped up the process over a traditional clay bar. I then used my Towel Titan Microfiber Wax and Polishing towel to remove the excess detail spray after claying. Once the paint was as contaminate free as I could make it (I skipped using a fallout remover since this car hasn’t spent much time outside since the last paint correction) I moved to the polishing stage. On this paint, since it’s just a pure white base coat with clear coat I just did a single step correction using Meguiar’s Ultimate Compound. I find that following up with a finer polish produces nearly indiscernible results. 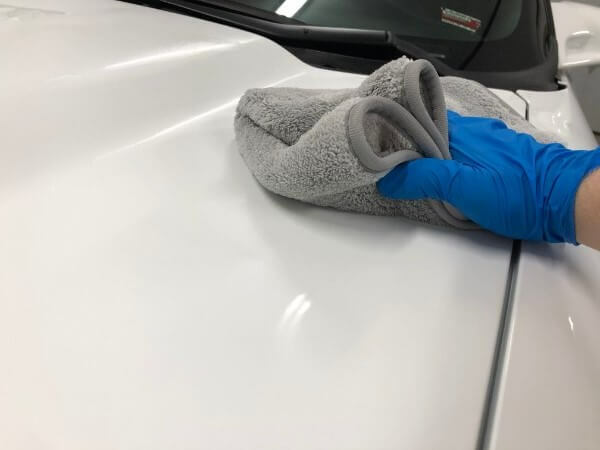 On a dark colored vehicle I would expect to see micro marring after compounding that would require a second polishing step. For this compounding run I used my trusty Griot’s Garage GG6 6″ Random Orbital Polisher with a Lake Country Orange Flat 5.5″ pad. I grabbed another clean plush Towel Titan Microfiber Wax and Polishing towel to wipe up my polish as I went. Once polishing was finished I needed to clean any polishing oils, waxes, and any other foreign substances from the paint so that the AvalonKing paing coating had pure paint to stick to. The typical way to do this is to wipe the car down with a 50/50 mix if Isopropyl Alcohol (IPA) and water. I go a step further and use a Wax and Grease Remover first and then do my IPA wipe down. I want to make darn sure there is going to be nothing between the coating and my paint. The paint is now as clean as it’s going to get and ready for the coating. Phwew, it’s finally time to lay the coating down. Now I’m going to admit here that I only prepped the hood at this point and only applied the coating to the hood. I wanted to use the coating on my project truck but it still has a couple weeks left for the new paint to cure and I couldn’t wait that long. So, I opted to use the hood of the Trans Am as my temporary test bed for kickstarting this review. This means it only took me a couple hours to get the hood ready for coating. If you were to prep a whole car following the steps above you would need to set aside the better part of a day. Enough about prep (though it really is everything), let’s see how this coating went on. I grabbed one of the included suede cloths and wrapped it around the applicator. There are several suede cloths included in the kit and only needed to use one for this test. 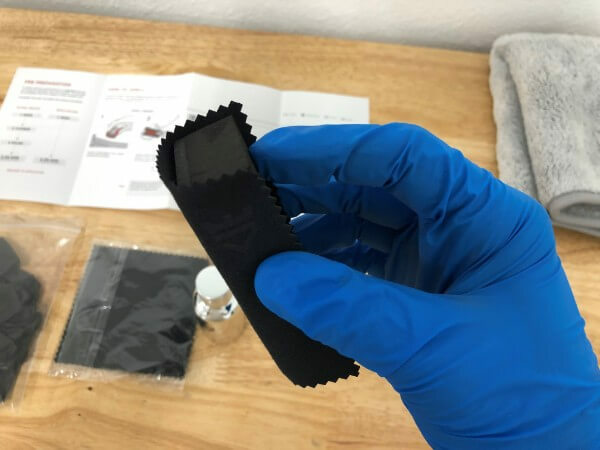 Both the cloths and applicator are high quality compared to the applicators included in most other competing coating kits. I had no trouble holding onto them and, as you’ll see below, them applying the coating smoothly. I shook the bottle of coating and applied it in a line down the center of the cloth until damp. The coating comes out the bottle in little drops with the consistency of water so it’s easy to control and doesn’t take much to prime the applicator. 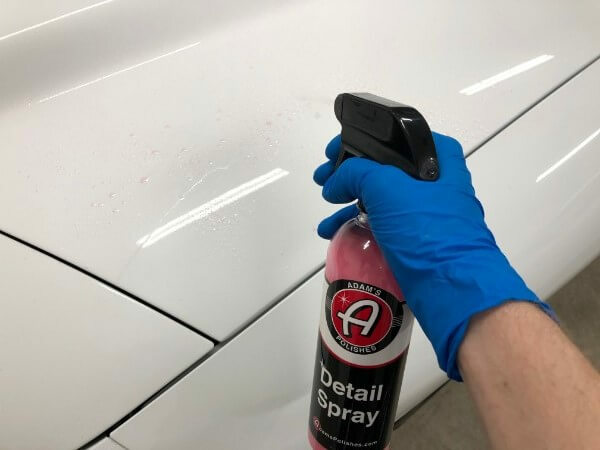 With bottle and applicator in hand, I walked over to the car and began wiping the coating on in long straight lines up the hood followed by straight lines across the hood. The hood on this car is large so I split it up into 4 sections and worked each one up and down and side to side until there was an even film of coating across the panel. 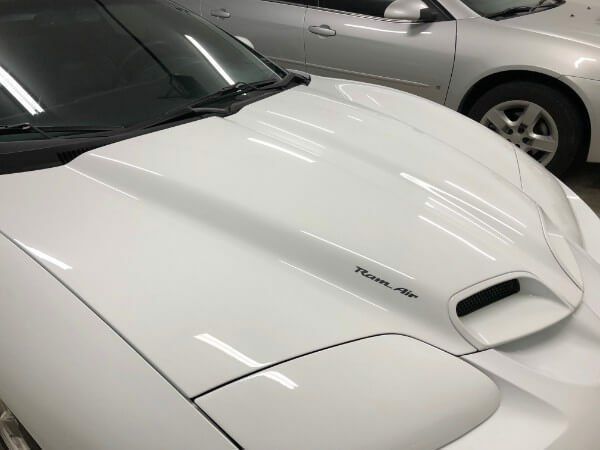 The coating went on very easily and, even in a 70* garage, I didn’t have any problems with it drying before I was finished which allowed me to get a nice smooth, even coat on. Of course I was also working pretty fast since I’ve done this more than a few times with other coatings and my have had a bit more confidence than a first time user. The instructions said to wait 1 minute in 70 degree plus temperatures before wiping off. I impatiently waited as told and then wiped away the excess coating with the included towel which, though a bit chincy, did work sufficiently. The excess coating is actually very easy to remove. Once I had wiped away all of the excess coating and made sure there were no high spots (places where excess coating remained), I was able to stand back and inspect the final finish. I was left with a nice “candied” gloss finish as you would expect from a ceramic coating treatment. I was unable to find any imperfections in the finish of the coating and everything appeared very even. Admittedly, white is a hard color to find finish flaws on. 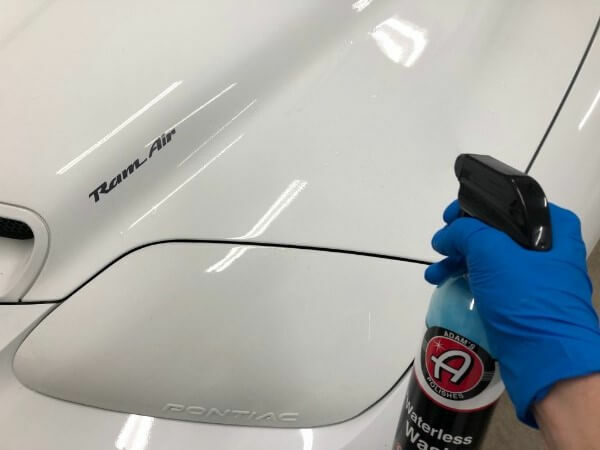 Is AvalonKing Armor Shield IX Ceramic Paint Coating Legit? I have to admit, I really liked AvalonKing Armor Shield IX Coating. For the DIY’er you’d be hard pressed to find a better all inclusive, well thought out kit with clear instructions and a great presentation that makes you feel good about what you bought for this price. 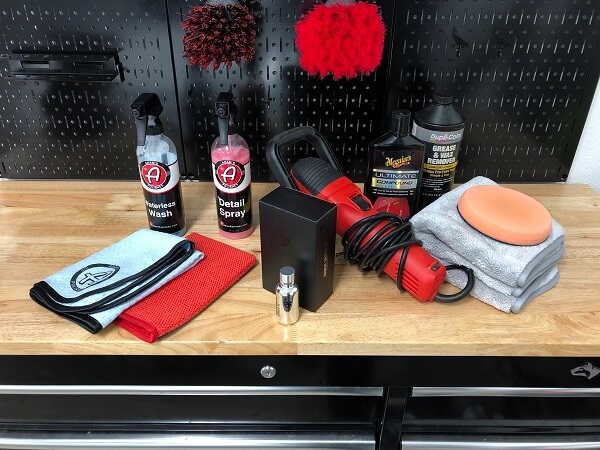 The kit has everything you need in sufficient quantity to do a proper job of coating a vehicle. The bottle is high quality with a good seal and a reliable application method that should ensure you don’t waste any of your coating. The coating itself doesn’t have an overpowering smell. It is very easy to work with, which can’t be said for many coatings on the market. I had no trouble applying the coating evenly and removing the excess. I also appreciate the more traditional suede cloth application versus the spray application of other coatings like the McKee’s 37 SiO2 Paint Coating (no risk of overspray on adjacent panels and glass). My only real complaint about the kit is the microfiber towel could be better. At the very least it could be a edgeless towel. I’m not a fan of the rough stitching on the included towel, though it can be worked around and is a moot point if you have your own towels. As for how the coating performs post application, I’m afraid I’ll have to come back later with my findings after some time with the coating on the paint has passed. 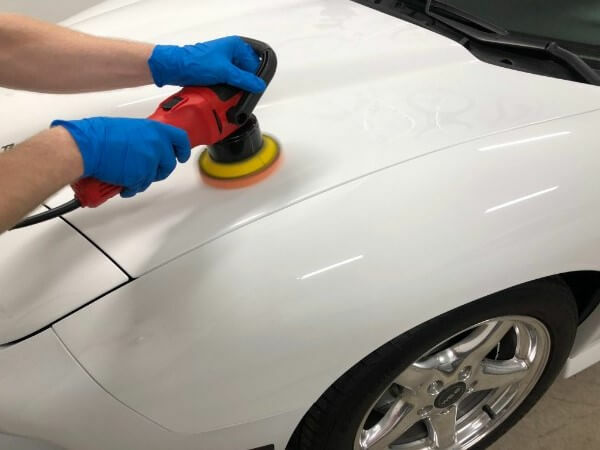 Much like automotive painting, coating a car is 98% prep and 2% application of product. 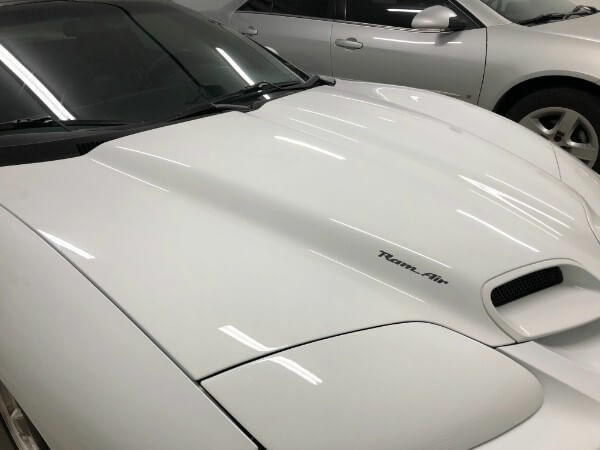 I’d like to take a moment and recap the products I used during the application of this coating that helped achieve the best outcome with the coating possible. Adam’s Polishes Waterless Wash – Quick and safe way to wash a mildly dirty vehicle. 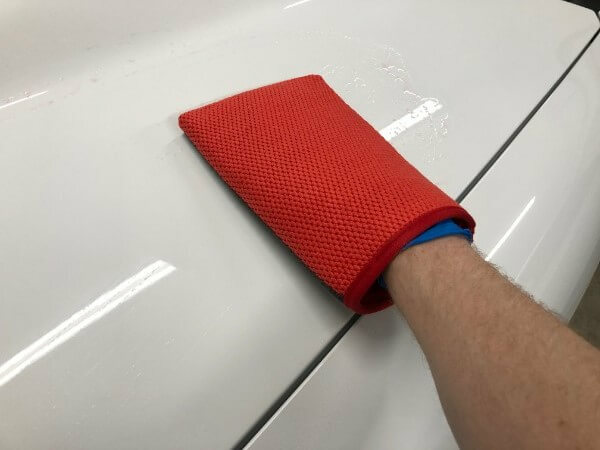 Adam’s Polishes Waterless Wash Towel – Quality waffle weave washing towel. Adam’s Polishes Detail spray – Slick and versatile detailing spray. 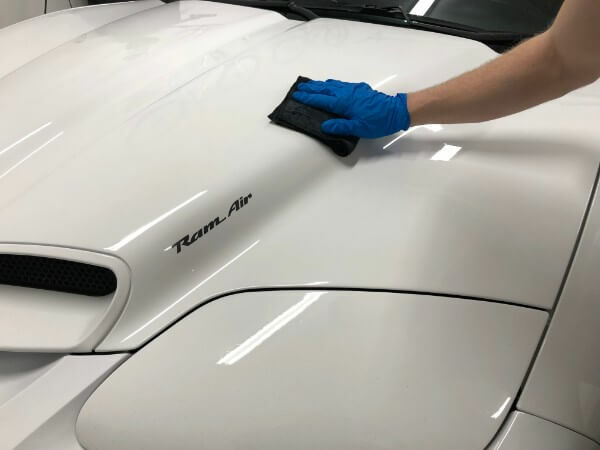 Adam’s Polishes Clay Mitt – Faster and more economical way decontaminate paint than a clay bar. Towel Titan Microfiber Polishing & Wax Towel – Quality affordable polishing towels. Griot’s Garage GG6 6″ Random Orbital Polisher – Arguably the best entry level DA polisher. Adam’s Polishes 5″ Backing Plate – Allows using more aggressive 5″ pads. Lake Country 5.5″ Orange Flat Pad – Great all-around buffing pads. Meguiar’s Ultimate Compound – Effective, user friendly and easy to find polishing compound. 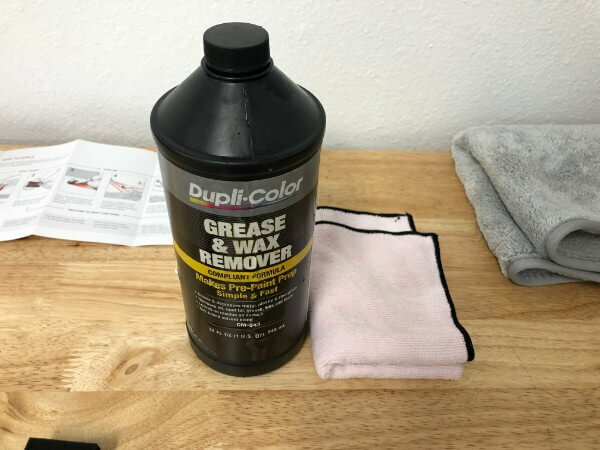 Duplicolor Wax & Grease Remover – Affordable over the counter paint cleanser. Isopropyl Alcohol and Water in a 50/50 mix (IPA wipedown) – Necessary to remove polishing oils. While it’s not necessary to use all of these products to apply a coating, they do ensure you achieve the best possible outcome. It also explains why paying a pro to apply a coating is so expensive. You’re mostly paying for their expertise and time, materials, and equipment to prep the car for the coating. All of the items in this list could be purchased for less than you’d pay a pro and you’d be left with some nice kit when you’re finished.